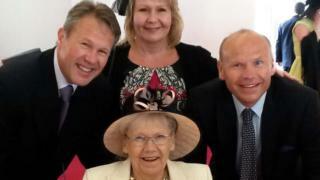 A woman who died after hospital staff did not immediately begin resuscitation when she was found unresponsive "stood a better chance" of surviving on a street, her family has said. Joyce Aisbitt, 86, died at Prospect Park Hospital after she went into cardiac arrest on 7 March 2018. A nurse told an inquest CPR should have started "straight away" after Mrs Aisbitt was found "unresponsive". The mental health hospital in Reading admitted failings in its care. Senior coroner Heidi Connor said despite Mrs Aisbitt being found "unresponsive", "not one of these experienced practitioners commenced CPR". She added the mother-of-three was left "between five to 10 minutes" before doctors and then paramedics tried to resuscitate her. Mrs Aisbitt's son, Nigel, told the BBC he expected Prospect Park to be "one of the safest places to be when you have a medical emergency". He added: "In this particular instance it was the worst place that you could have been. You would have probably stood a better chance being out on the street and have a member of the public who would jump in and do what was expected." Image caption Joyce Aisbitt's family said she was a "fun, loving and caring individual who deserved a lot better"
The court heard Mrs Aisbitt, who suffered from depression, atrial fibrillation and vascular dementia, had "turned blue" when doctors arrived after being called. Susan Chikosi, a nurse at the hospital, said she "panicked" when she saw Mrs Aisbitt in the early hours, and told the inquest CPR "should have been done straight away". The court heard a "crash bag" containing equipment used when resuscitating patients was not in the room and when one was found, a face mask was "missing". Support worker Drashan Birk was asked by the coroner whether her observation notes on Mrs Aisbitt had been "falsified". Told that her answer could have "criminal consequences", she replied: "I'm not answering." Mrs Connor ruled the former nurse died of natural causes, and said "the question whether Mrs Aisbitt would have survived with different management is not clear". Rosemary Warne, acting clinical director at Berkshire NHS Foundation Trust, said the organisation fell short in "preparing our staff for that situation". She told the court the trust had "learned from this situation" and training had been given to staff.